The mother of a Londonderry boy has told an inquest that she did not give doctors at the Royal Belfast Hospital for Sick Children permission to switch off his life support. Orin McBride, 14, from Strabane Old Road in the Waterside area, had a complex medical history including hydrocephalus, epilepsy and autism. He was diagnosed with pancreatitis in March 2015 and died on 28 June 2015. One of Orin's doctors said there was nothing staff could do to save him. 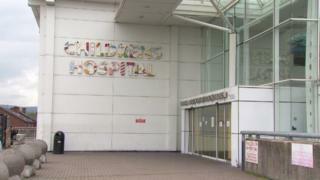 The teenager had been transferred to Belfast from Altnagelvin Hospital in Derry. The inquest, sitting at Strabane courthouse, into the circumstances of his death was told that a decision had been made on 28 June 2015 by doctors treating Orin to switch off the machines keeping him alive and "let nature take its course". His mother, Majella McBride, who had been told of this decision, said she left the room and told the doctors: "I want to go to Orin. I want to see him before he leaves this earth." Ms McBride insisted she did not consent to the action. She told the court that when she went into the room the ventilator had been removed and she asked the nurse: "Where is his ventilator? Where is his oxygen?" She said no-one replied to her. A short time later, Orin was moved to a side room and passed away in his mother's arms. Asked directly by the coroner, Patrick Mr McGurgan, if she had given her permission, Ms McBride said: "No I did not." "I don't think it registered with me," she added. "I just wanted to be with my son." Ms McBride was asked about notes taken by one of the doctors at the meeting which suggested she told the doctors Orin had "fought long enough, just make him comfortable". Ms McBride refuted this strongly saying: "I did not say any of that, that is lies. I know for a fact I did not say that." "He (Orin) deserved care he didn't get. He shouldn't be where he is today." The court was told Orin had been admitted to Altnagelvin hospital on 17 June 2015 where he continued to deteriorate, before being transferred to the Royal Belfast Hospital for Sick Children. During this journey Orin became unconscious and was admitted into the intensive care unit. One of the doctors caring for Orin while he was in this unit was Dr Mark Terris, a consultant paediatric anaesthetist, who was the clinician in charge of Orin's care during the 24 hours of the 28 June. Dr Terris outlined to the court how gravely ill Orin was and that, as well as pancreatitis, the boy was also experiencing multiple organ failure. Dr Terris told the court the team caring for Orin had contacted hospitals in Glasgow and Leicester about the possibility of transferring Orin there because they had specialist treatment centres, but that those hospitals did not think Orin was suitable for transfer. The doctor said it was agreed to remove support from Orin and that this agreement included Ms McBride. Asked if he recalled Ms McBride saying her son had fought long and hard and that he should be made comfortable, Dr Terris said: "I don't recall her (Ms McBride) exact words but I don't doubt it if that is what Dr Christie wrote. "There was an agreement that Orin was going to die, with or without us. "I do recall her being very upset, but I understood it was because of what was going to happen." Asked by Mr McGurgan if he was satisfied Ms McBride took on board what was said and what was going to happen, Dr Terris said there was agreement. Speaking directly to Ms McBride in court, Dr Terris said: "I apologise if that was not clear to you. "Sadly Orin was dying and nothing we could have done was going to save him."